ABSTRACT:Appropriate technology transfer is both integral and critical to drug discovery and development for new medicinal products and is also important to upgrade drug quality designed during research and development and to final product during manufacturing as well as to assure stable quality transferred. Successful development and commercialization of innovative technologies is always fraught with difficulties, multifaceted endeavour, and a variety of development tools exist to promote this activity, by far the most popular approach to directly promoting successful innovation is through technology transfer. To successfully and simultaneously develop appropriate clinical good manufacturing practice facilities, specify and design specialized process equipment, finalize process details, and correctly determine scale-up parameters requires the integrated efforts of a highly skilled technology transfer team. Successful technology transfer requires carefully studying numerous situations like careful evaluation of ultimate manufacturing requirements early in research and development and the consequent development of robust processes that withstand large-scale operation, the assembly of a detailed technology transfer document that provides manufacturing with both “know how” and “know why,” and will serve as the basis for facilities and equipment design as well as operator training and standard operating procedure generation and the management of a closely integrated and cooperative technology transfer team with membership from development, manufacturing, engineering, quality, validation, and management to ensure that the new process is carefully and thoroughly taught to all involved, that fine details as well as broad objectives are clearly in focus until the new process is through consistency lots and in successful manufacturing. SCIENCE, TECHNOLOGY, PRODUCT, INNOVATION AND COMMERCIALIZATION: Scienceis knowledge regarding certain principles of nature. Technology is defined differently. Sociologists, economists, management scientists and other faculties have their own definitions of technology. Apparently there are professional definitions for this word, but all have common aspects. There are different aspects for technology. Cultural Aspect: It contains goals, values, morals, beliefs, awareness and creativity. Organisational Aspect: It includes industrial, economical, professional and technical activities, users, customers and commercial unions. Technical Aspect: Knowledge, skills, techniques, tools, machineries, sources, and production are considered as technology. Therefore Technology is the application of engineering to science, the use of our understanding of nature to develop a technical method for achieving a practical purpose 1. Productis the application of technology in a particular physical form designed to carry out a specific set of functions. Innovation in the context of technology companies, can be defined as “a complex process that takes place at the level of specific products, businesses and sectors, as well as at the level of our national and international community’s” (Smits 2002: 865) that generate technical artefacts, processes and sociotechnical systems and collectives or it is the ability to take new ideas and translate them into commercial outcomes by new processes, products or services 2. Commercialization is the process of transforming new technologies into commercially successful products. The commercialization process includes such efforts as market assessment, product design, manufacturing engineering, management of intellectual property rights, marketing strategy development, raising capital, and worker training. Typically, commercialization is a costly, lengthy process with a highly uncertain outcome. The costs of commercialization can run from between 10 and 100 times the costs of development and demonstration of a new technology. Moreover, success is rare, less than five percent of new technologies are successfully commercialized 3. Even when successful, technology commercialization does not happen quickly. Commercialization of radically new technologies can take well over a decade as shown in figure 1. LITERATURE OF TECHNOLOGY TRANS FER: Based on a review of literature, technology transfer is not a new business phenomenon or not a new thing. During the colonial era, technology transfer by colonial powers to production entities in their colonies was mainly in the primary sector such as mining, plantation and agriculture (Ramanathan 1989). Those transfers were aimed at the development of methods and techniques in order to obtain the maximum output in export industries such as mining and plantation agriculture and the development of infrastructure for such industries. In a similar vein economists such as Arrow (1969) and Dosi (1988) have analysed technology transfer on the basis of the properties of generic knowledge, focusing particularly on variables that relate to product design. The term technology transfer can be defined as the process of movement of technology from one entity to another (Souder et al. 1990; Ramanathan 1994). The transfer may be said to be successful if the receiving entity, the transferee, can effectively utilize the technology transferred and eventually assimilate it (Ramanathan, 1994). In a very restrictive sense, where technology is considered as information, technology transfer is sometimes defined as the application of information into use (Gibson & Rogers 1994). The considerable literature on technology transfer that has emerged over the years agrees that defining technology transfer is difficult due to the complexity of the technology transfer process (Robinson 1988; Spivey et al. 1997). Mittleman and Pasha (1997) have attempted a broader definition where they state that technology transfer is the movement of knowledge, skill, organisation, values and capital from the point of generation to the site of adaptation and application. The definitions depend on how the user defines technology and in what context (Chen 1996; Bozeman 2000). The movement may involve physical assets, know-how, and technical knowledge (Bozeman, 2000). Technology transfer has also been used to refer to movements of technology from the laboratory to industry, developed to developing countries, or from one application to another domain (Philips 2002). Technology transfer in some situations may be confined to relocating and exchanging of personnel (Osman-Gani 1999) or the movement of a specific set of capabilities (Lundquist 2003) 4. It may be useful to examine the distinction between technology transfer and technology diffusion. The terms technology transfer and technology diffusion appear in the business and technology literature and are used interchangeably at times. There is some difference between the two terms between the European context and the North American and this literature review will respect which term is used in the original article discussed in the annotation. The sociological literature, which draws a more direct link to Rogers' work ( 2003; 1976) refers to the diffusion of innovation. Innovation diffusion broadly describes the process whereby a product or service and the knowledge of its use and application moves from a source, such as a research and development domain to a point of reception leading in the classic description of the process to commercialization, market adoption and uptake (Bozeman 2000). Sociologists such as Rogers, Shoemaker (1971) and Rogers (2003) have defined technology transfer in the context of diffusion of innovations. This has led to confusion where many researchers and even practitioners, refer to the terms technology transfer and technology diffusion interchangeably. The literature on technology diffusion, in general, suggests that the term refers to the spreading, often passively within a specific technological population, of technological knowledge related to a specific innovation of interest to that population. Technology transfer, on the other hand, is a proactive process to disseminate or acquire knowledge, experience and related artefacts (Hameri 1996). Furthermore, it is intentional and goal-oriented but not a free process (Autio and Laamanen 1995). Transfer also presupposes agreement and therefore involves agreement, unlike diffusion (Ramanathan 1991; Hameri 1996) 3-4. 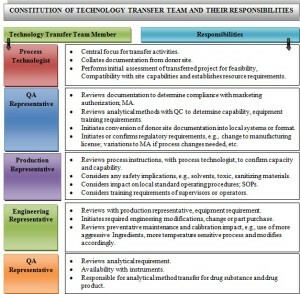 Based on the above literature discussion, Commercial Technology Transfer may be defined as a mutually agreed upon, intentional, goal oriented and proactive process by which technology flows from an entity that owns the technology (the transferor) to an entity seeking the technology (the transferee). The transfer may be said to be successful if the transferee can successfully utilize the technology for business gains and eventually assimilate it. In general, Technology Transfer is the practice of transferring scientific findings from one organization to another for further development so that new products such as medicines, educational tools and health services so that they can become available to the public and by which basic science research and fundamental discoveries are developed into practical and commercially relevant applications and products. 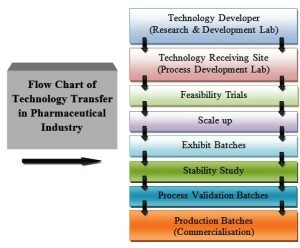 In Pharmaceutical Industry, technology transfer refers to the processes that are needed for successful progress from drug discovery to product development to clinical trials to full scale commercialization as shown in figure 2 or it is the process by which a developer of technology makes its technology available to commercial partner that will exploit the technology 8. CLASSIFICATION OF TECHNOLOGY TRANSFER: The work of Hayami, Ruttan (1971) and Mansfield (1975) provide some of the earliest insights on the modes of technology transfer which are of relevance even today. Mansfield (1975) classified technology transfer into vertical and horizontal technology transfer. Vertical transfer refers to transfer of technology from basic research to applied research to development and then to production respectively. Horizontal transfer refers to the movement and use of technology used in one place, organisation, or context to another place, organisation, or context. Souder (1987) refers to the former as internal technology transfer and the latter as external technology transfer. Souder further elaborates upon vertical technology transfer as a managerial process of passing a technology from one phase of its life cycle to another. This elaboration is valuable because it serves to reinforce the fact that it may be possible to horizontally transfer technology at any stage of the technology life cycle. Hayami, Ruttan (1971) and Mansfield (1975) refer to Material transfer, Design transfer, and Capacity transfer 5. Material transfer refers to the transfer of a new material or product while Design transfer corresponds to the transfer of designs and blueprints that can facilitate the manufacturing of the material or product by the transferee 11. Capacity transfer involves the transfer of know why and know-how to adapt, and modify the material or product to suit various requirements. While Hayami and Ruttan focused on Agricultural technology transfer, Mansfield emphasised Manufacturing technology. 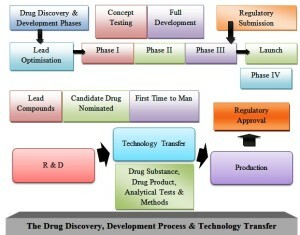 DRUG DISCOVERY, DEVELOPMENT PROCESS AND TECHNOLOGY TRANSFER: Technology transfer is a process to transfer information and technologies necessary to manufacture quality drug product consistently or technology transfer is the process of taking an invention from its inception in a laboratory to a commercialized product. The successful technology transfer from R&D, the transferring site, to the commercial production site, the receiving site, is a critical process in the development and launch of a new medicinal product. It can be extremely costly for a company if things go wrong during the transfer process, resulting in delays to launching a new product on the market and lost sales. Also, it can take increased resource, time and cost to make corrective actions following an unsuccessful transfer. Progressive pharmaceutical companies are therefore placing more attention to streamlining and optimising their technology transfer process to ensure the rapid and successful introduction of a new medicinal product to market. Generally the cost of product development raises dramatically during the pilot scale-up and initial production batch efforts. In other words, the critical path for success is dependent on completion of the technology transfer to the production site at an affordable cost 6. The process of technology development and commercialization takes place over three broad phases- The development of new science, the conversion of science to technology and the conversion of technology to products. The drug quality is designed based on basic data concerning efficacy and safety obtained from various studies in preclinical phases and data concerning efficacy, safety and stability of drug products obtained from clinical studies. Phase I clinical studies involve small scale studies in patients and these are often provided for in the form of a simple non-optimized formulation, quite different from the intended commercial formulation, because time for development and availability of drug are limiting factors at this stage. There is a high probability that the project will be terminated during Phase I due to toxicity findings or clinical findings (safety, efficacy and pharmacokinetics/bioa-vailability). If unwanted or unexpected effects are observed, the programme will most likely be stopped and the project goes back to the research group to try and find another lead compound. Alternatively, if the outcome is positive, the Candidate Drug; CD may be progressed to full development as shown in figure 3. Full development involves the completion of longer-term safety and clinical studies (Phase II and Phase III) in larger groups of patients (hundreds to thousands) suffering from the disease. During full development, the synthetic route for the Drug Substance; DS is optimized and the manufacturing process scaled up and fixed. Larger scale batches of drug substance will be required to support larger safety and clinical studies and also to support the pharmaceutical development work to optimize the formulation and Drug Product; DP manufacturing process. If sufficient Drug Substance is available and the Phase III supplies are very large, it may be preferable to scale-up the manufacturing process to production scale and transfer the process to the commercial production site to make the Phase III supplies from there 7. One potential downside of transferring early to production is that all the development work has to be completed earlier in the development programme to fix the formulation and manufacturing process and this puts the pharmaceutical development on the critical path. It is possible to make further changes after transferring the process to production, but these are more difficult and involve documented change control. Starting the technology transfer prior to the start of Phase III is also a risky approach because statistics show that there is still a relatively high attrition rate during Phase II due to both efficacy and clinical safety failures. However, one positive benefit of this approach is that it is usually easier for the company to demonstrate that Drug Product used in the pivotal Phase III clinical trials is equivalent to the intended commercial product, assuming that any changes during Phase III are minimal. This should pave the way for a more straightforward Pre Approval Inspection; PAI when it comes to regulatory review of the Product Licence Application (referred to as the Marketing Authorisation Application; MAA in Europe and the New Drug Application; NDA in the USA and Japan). 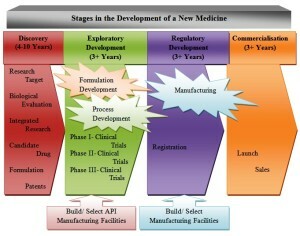 Most regulatory authorities, including the US Food and Drug Administration; FDA, the Medicines and Healthcare products Regulatory Agency; MHRA in the UK and the European Agency for the Evaluation of Medicinal Products; EMEA, require three phases of clinical trials and sufficient data to show that the new Drug Product can be licensed as safe, effective and of acceptable quality. If clinical batches of Drug Product are being manufactured under replicated conditions during the latter stages of development, e.g., Phase III, even if still at the R&D site, the regulatory authorities will expect that some process validation will have been undertaken. Once the commercial manufacturing process has been transferred from R&D to Production, the process must be validated to meet regulatory requirements if an MAA or NDA is progressed as shown in figure 4. Once the Phase III clinical trials are completed successfully and the Drug Substance; DS, Drug Product; DP and analytical methods have been transferred to the intended production sites, a regulatory submission can be made. Pending approval of the submission and a successful Pre-Approval Inspection (required if the product is intended for the United States), the new product can be launched on the market. After above discussion it can be concluded that technology transfer; TT is the transfer of the manufacturing process for a new pharmaceutical Drug Substance; DS and Drug Product; DP respectively from the transferring site (in this case R&D) to the receiving site or designated commercial Manufacturing site. This includes all the associated knowledge, information and skills to be able to manufacture the DS and DP at the receiving site. Information will include that related to the Drug Substance, the formulation, the pack or device used the manufacturing process and the associated critical quality parameters. TT also involves the development and successful transfer of the analytical and microbiological test methods and specifications for the DS and DP that will become the final Quality Control; QC procedures used at the commercial Production site. STEPS IN TECHNOLOGY TRANSFER PROCESS: Technology Transfer is not a single way process. The development of new formulation goes through many stages. During development of a formulation, it is important to understand procedure of operations used, critical and noncritical parameters of each operation, production environment, equipment and excipient availability, which should be taken into account during the early phases of development of formulation, so that successful scale up can be carried out. Research phase, development phase and production phase. Data based on various data such as chemical and physical properties, efficacy, safety and stability obtained from preclinical studies. For drug substance the quality design is to determine starting materials and their reaction paths and basic specification of the drug. Research for factory production: To manufacture drugs with qualities as designed, it is required to establish appropriate quality control method and manufacturing method, after detecting variability factors to secure stable quality in the scale up (validation) that is performed to realize factory production of drug designed on the basis of result from small scale experiments. When product specification is established on the basis of the quality of the product determined in the above, it is required to verify that the specification adequately specifies the product quality 12. Relations between upper and lower limits of manufacturing formula (composition and manufacturing methods) and upper and lower of control limits of the product specification should be fully understood, and the consistency between the product quality and specifications should be maintained. In short, the consistency between quality and specification is to ensure in the products specification that the quality predetermined in the quality design is assured as the manufacture quality, and the product satisfies the quality of design. For this purpose, the transferring party in charge of development should fully understand what kind of technical information is required by the transferred party in charge of manufacturing and should establish an appropriate evaluation method to determine whether a drug to be manufactured meets the quality of design. For stable production of consistent products, it is fundamental to fully refer to information of similar products of the past maintained by the manufacturer when research for factory production is implemented. Master formula card; MFC: It includes product name along with its strength, generic name, MFC number, page number, effective date, shelf life and market. Master packaging card: It gives information about packaging type, material used for packaging, stability profile of packaging and shelf life of packaging. Master formula: It describes formulation order and manufacturing instructions. Formulation order and Manufacturing Instructions gives idea of process order, environment conditions required and manufacturing instructions for dosage form development. Specifications and standard test procedure; STPs: It helps to know active ingredients and excipients profile, in- process parameters and specifications, product release specification and finished product details. Production is implemented after various validation studies verify that it is able to stably product based on transferred manufacturing formula. While the manufacturing facility accepting technology is responsible for validation, the research and development department transferring technology should take responsibility for validation such as performance qualification; PQ, cleaning validation, and process validation; PV unique to subject drugs. SCALE UP FOR PRODUCTION: Scale up involves the transfer of technology during small scale development of the product and processes. It is essential to consider the production environment and system during development of process10. Operators should concentrate on keeping these things in mind that their segment of the production process running smoothly if technology transfer is implemented thoughtfully. Effective technology transfer helps to provide process efficiency and maintain product quality. To accumulate technical information obtained from repeated production. The information of modify various standards. The improvement of process and products. The changes of specifications and methods. The technical information of reviewed and updated at regular intervals. Establish of adequate Feedback system. EXHIBIT BATCHES: After taking scale up batches of the product, manufacturing of exhibit batches takes place. In case of exhibit, batch sizes are increased along with equipments and their processes. This is done for filling purpose in regulatory agencies. The Purpose behind to run three consecutive batches are to shows process consistency, reproducibility and to demonstrate that the manufacturing process is under control throughout all the stages. Forming alliances with partners that can progress the development to take it to market: The developer of the technology might have the resources to take the technology to particular state of development, such as up to animal studies and toxicology studies, but does not have the resources to take the technology through its regulatory phases and must collaborate with another organization to take it through these phases and into the market. Forming alliances with partners with manufacturing capability: The developer of the technology may have taken the technology to a state of development so that it is near market ready but does not have the clean room manufacturing capability or resources to manufacture the product and must partner with another organization that does have the capability. The developer of technology may only have manufacturing equipment which is suitable for small scale operation, and must collaborate with another organization to do large scale manufacturing. Forming alliances with partners with marketing and distribution capability: The developer of the technology may have fully developed the technology and even have obtained regulatory approvals and product registrations for the product to be sold but it lacks the marketing and distribution channels to give it a marking capability and must collaborate with another organization that does have that capability. Lack of resources to launch product commercially: The original inventor of technology may only have the resources to conduct early-stage research such as animal studies and toxicology study, but doesn’t have the resources to take technology through its clinical and regulatory phases. Exploitation in a different field of application: The developer of the technology might be capable of exploiting the technology itself in the field of diagnostic applications and may grant exploitation right to commercial partner for the exploitation of therapeutics applications. By transferring the technology for the use in another field of application to another person, the developer of the technology creates another income stream from the exploitation that takes place on that place in that other field. In the exploitation of pharmaceutical products technology transfer by collaborating with this way to bring a pharmaceutical product to market is common feature of the industry. IMPORTANCE OF TECHNOLOGY TRANS FER 20: The importance of technology transfer from a development perspective is nothing new. More than three decades back, Mansfield (1975) pointed out that, “One of the fundamental processes that influence the economic performance of nations and firms is technology transfer. Economists have long recognized that the transfer of technology is at the heart of the process of economic growth, and that the progress of both developed and developing countries depends on the extent and efficiency of such transfer 15. In recent years economists have also come to realize or rediscover the important effects of international technology transfer on the size and patterns of world trade.” Technology transfer is an area of interest not just to business, economists, and technologists but also to other disciplines such as anthropology and sociology (Zhao and Reisman, 1992). While anthropologists emphasize the impact of TT on changes in patterns of culture and society, sociologists are more concerned with its role as a vehicle to develop the capacity of individuals and societies to cope with modernisation and related changes accompany it. For economists, as argued by Mansfield (1975), the focus is on economic growth and achievement of economic goals. However, from the perspective of business and technologists the main focus of TT is to improve the competitive advantage of firms through the enhancement of customer value (Ramanathan, 2001). It is envisaged that, through the improvement of competitive advantage, a firm and its partners collaborating in the TT will gain financial and other strategic benefits. Mayer and Blaas (2002) point out that, in recent decades, small and medium enterprises; SMEs have begun to utilize technology transfer as a strategic means of meeting challenges posed by the globalisation of business. Due to their small size and skill resource constraints, they cannot carry out internal R&D to generate their own technologies but still need a flow of new technology to be able to compete. This need has created a new niche market for technology transfer (Morrissey & Almonacid 2005). The importance of technology transfer, from an economic and competitiveness perspective, has also stimulated university industry technology transfer. This is evident from the emergence of technology transfer offices in most research industries and universities (Siegel et al. 2004). Ramanathan (2000) shows that in today’s international business setting, depending on the attributes of the technology, its intended use, and the motivations of the transferee and transferor, a wide range of TT modalities are available 16. In pharmaceutical industry, Technology Transfer is the practice of transferring scientific findings from one organization to another for further development so that new products such as medicines, educational tools and health services can become available to the public. It is the intersection between business and science and it is both integral and critical to the drug discovery and development process for new medicinal product. This process is important for elucidation of necessary information for technology Transfer from R&D to Process Development Laboratory and for development of existing products to the production for commercialization. It is helpful to develop dosage form in various ways like it provides efficiency in process, help to maintain quality of product, helps to achieve standardized process which in turn facilitates timely and cost effective production. If the technology transfer is implemented thoughtfully then production process run smoothly, minimize the risks during production runs and a robust manufacturing process for routine commercial manufacturing is achieved. The technology transfer means actions to transfer information and technologies necessary to realize quality of design of drugs during manufacturing. Appropriate technology transfer is important to upgrade the quality of design to be the quality of product, and ensure stable and high quality of the product. It should be noted that drugs may influence human lives and health, and their raw materials, compositions and manufacturing methods are changed during their long term manufacturing and marketing. To assure the drug quality, it is desired to make sure 5 W’s and 1 H, that is what, when and why information should be transferred to where and by whom and how to transfer, then share knowledge and information of the drug product between transferring and transferred parties . The technology transfer does not mean one time actions taken by the transferring party toward the transferred party, but means continuous information exchange between the both parties to maintain the product manufacturing 22. Technology transfer can be considered successful if a receiving unit can routinely reproduce the transferred product, process or method against a predefined set of specifications as agreed with a sending unit or a development unit. TECHNOLOGY TRANSFER DOCUMEN- TATION 18-19: Technology transfer documentation is generally interpreted as documents indicating contents of technology transfer for transferring and transferred parties. The raw data of the documents should be prepared and compiled accordingly and should be always readily available and traceable. For successful technology transfer, task assignment and responsibilities should be clarified and acceptance criteria for the completion of technology transfer concerning individual technology to be transferred. Quality assurance department should established confirmation process for all kinds of technology transfer documentation and should check and approve the documentation. A successful technology transfer document contains both “know how” and “know why.” With antecedent and peripheral information, members of the technology transfer team have more to work with, can better evaluate options and can distinguish the critical from the incidental. This document is to provide all relevant information so that the transfer goes easily and smoothly, future changes can be made in full understanding of why the process and product is in its current configuration, and the reasons for the selection of particular unit operations, equipment, and conditions, can be clearly understood. Organization for Technology Transfer: One of the most significant elements for successful technology transfer is a closed communication between transferring and transferred parties. Therefore, organization for technology transfer should be established and composed of both party members, scope of responsibilities of each party should be clarified and feedback of information should be ensured. It is desirable that this organization complies with GMP 21. Historical data of pharmaceutical development of new drug substances and drug products at stages from early development phase to final application of approval. Rational for dosage form & formula designs and design of manufacturing methods. Rational and change histories of important processes and control parameters. Quality Profiles of manufacturing batches, including stability data. Specifications and test methods of drug substances, intermediates, drug products, raw materials, and components, and their rationale; validity of specification range of important tests such as contents impurities and dissolution, rational for selection of test methods, reagents and, columns, and traceability of raw data of those information. Information necessary for the start and continuation of product manufacturing and necessary for quality assurance of the product; Development Report. Information necessary for assurance of operation safety. Information necessary for environmental impact assessment. Other specific information of the product. Describe items and contents of technology to be transferred. Describe detailed procedures of individual transfer and transfer schedule. Establish judgment criteria for the completion of the transfer. The transferring party should prepare the plan before the implementation of the transfer, and reach an agreement on its contents with the transferred party 24. Report the data after technology transfer according to the technology plan. Evaluation the data and the predetermined judgment criteria. Both transferring and transferred parties can document the technology transfer report; however, they should reach an agreement on its contents. TECHNOLOGY TRANSFER TEAM 25: Science technology and products are very rarely created in a vacuum, depending solely on internal expertise. The technology transfer team is a cross-functional team representing all departments, suppliers, and customers involved in the transfer. Each representative provides information on his/her functional area’s needs, works on action items, organizes and directs work on his/her aspect of the project, and supplies information to the team that is expected to impact other areas as shown in figure 5. When the management decides to transfer a given process from development to manufacturing, the development project team should meet and establish the technology transfer team. The team is then trained on the technology transfer process, so that each member is thoroughly familiar with both the business methodology to be used and the technical aspects of the process being transferred. The team members must then be trained on the use of the process tools, to help organize and assemble numerical data, assign action items, determine the current level of readiness, and identify areas of weakness or omission. At this point it is possible to define and follow a reasonable course of action 26. Successful technology commercialization depends on access to a skilled workforce in management, production, sales, distribution, and support. The mission of technology transfer team is to develop and implement a methodology that ensures the effective and efficient transfer of robust and well documented candidate production processes from development to manufacturing 27. The ultimate goal for successful technology transfer is to have documented evidence that the manufacturing processes for drug substances and drug product, respectively, are robust and effective in producing the drug substances and drug product complying with the registered specifications and good manufacturing practice requirements. Filing of the drug product in different regulatory markets or countries for approval through an effective technology transfer. TRAINING BETWEEN DEVELOPMENT AND MANUFACTURING: Effective training of all involved in the new process, from production operators to regulatory personnel involved in preparing the license submission, is essential to project success. Training is required in both the understanding of the technology transfer process and in the technical transfer. Training in the technology transfer process provides a structure for subsequent training in the process technology. Generally, training is initiated during validation activities installation qualification; IQ, operational qualification; OQ, performance qualification; PQ and completed during production scale qualification; PSQ. Following standard cGMP requirements, all training is documented, and involves identified members of all relevant departments 28. Preparation of a business case, based on market assessments, realistic forecast demands of the final product, and reasonably accurate operating costs, to show how the proposed TT project can enhance competitiveness, profitability, and growth 32. Construction of technology roadmaps in priority areas to define future trends to avoid the pitfalls of buying out-dated, inappropriate technology and ensure non-obsolescence of technology. Preparation of a detailed technology transfer agreement. Preparation of a detailed technology transfer implementation plan based on the decisions reached during negotiations. Preparation of a scheme to assess the impact of a technology transfer project from market, financial, technological and organizational perspectives. Avoids the technology transfer only by handing over the technology transfer documentation 29. Both parties should cooperate to implement technology education training and validation at facilities where the transferred technology is actually used. VERIFICATION OF RESULT OF TECHNOLOGY TRANSFER: After the completion of technology transfer and before the start of manufacturing of the product, the transferring party should verify with appropriate methods such as product testing and audit that the product manufactured after the technology transfer meets the predetermined quality and should maintain records of the results 30. Good business and manufacturing practices: The Company’s success is primarily the result of its adoption of good business and manufacturing practices, particularly in the areas of product identification and formulation technology. Potential for competitive pricing: Balance cost to remain competitive by having higher private sector prices and very low public sector prices. Strategic planning: Create an enabling environment for vertical integration, with prospects for higher capacity utilization and eventual lowering of production costs. Promising market scale and accessibility: While it is not easy to define the market size or type that will make for viable economic production, it is generally the case that, the larger the country or geographic bloc, the greater the market potential and investment appeal. Adherence to regulatory standards: The pharmaceutical industry is one of the most heavily regulated, to ensure quality, safety and efficacy of its medicines and the well-being of patients. The ability to meet international regulatory standards, or at least those of the major markets, is a precondition for many technology transfer activities. Regulations and standards apply also in low- and middle-income countries. For example, governments require product registration and data submissions to demonstrate quality, safety and efficacy. Skilled workforce: Human capital is an essential element of the technology transfer process. The successful absorption of technology or know-how in the recipient country and its translation into greater economic development hinges on the availability in the host country of an educated workforce with, for example, engineering and management skills. Innovation- friendly environment with sound Intellectual Property Protection and Enforcement: To successfully attract imported technology and to build the necessary preconditions for adapting imported technology, countries need a supportive environment that includes strong intellectual property protection and enforcement. Effective enforcement of any intellectual property laws and regulations already in force provides transparency and certainty for investors, licensees and customers. The level of intellectual property protection tends to be directly and positively linked to the rate of technology transfer. Proper access to information or increased information exchange: Where adequate intellectual property systems are in place, attention should be given to supporting access to information. 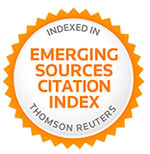 This has a number of dimensions, from better documentation of available resources, to the longer-term issue of addressing the complexity of the global knowledge market. In the absence of effective systems for disseminating market-relevant information, technology-holders may find it difficult to identify precisely who is interested in purchasing their technology, while technology-demanders face a similar challenge in finding entities willing to transfer their technology. Opportunities for contingency supply: Multinational pharmaceutical companies are inclined to transfer technology to local manufacturers with the potential to receive when they foresee an inability to meet time scales and volume demand from large procurers. Access to new machinery, training, know-how and business partnership: This makes the prospect of technology transfer very desirable to local pharmaceutical manufacturers since the technology, equipment, etc. could be applied profitably beyond the initial purpose. Lack of awareness knowledge and efficiency: Automation of production processes to improve efficiency and lower costs. Web access and scientific publication: Limited access to scientific journals led to enormous problems for developing nations scientists. Cost of prequalification: There is benefit in meeting International Standards since it opens up the opportunity for trading across the entire world. National security issues and restrictions on exports of particular technology: International controls designed to protect national security and to prevent the proliferation of important technologies also restrict the flow of technologies. Inadequate funding in important areas and possible treaties: There are areas of research of importance to the developing world that are being funded inadequately. Labour issues: The pharmaceutical sector demands relatively skilled labour. High labour turnover and absenteeism owing to unattractive conditions of service is negative contributor. Commercializing publicly funded technologies: The basic pattern envisioned is to give institutions receiving public research funds the right to obtain and exploit patents on inventions developed in the course of research. Political stability and good transparent governance: A country’s relative political and economic stability will influence the rate of inward technology transfer and can be seen as a pre-condition for any technology transfer. Even when research-based pharmaceutical company technology transfers are philanthropic in nature, they need to be sustainable in order to achieve their goals. Political leadership is critical to address global and local health challenges and, more importantly, healthcare system capacity strengthening. Research tool patents and freedom to operate for the public sector: Patents sometimes make it difficult for public researchers to carry out their research or to make the products of that research available. It is intensified by the tendency of some publicly funded research laboratories to avoid use of a patented technology without permission even in nations where no relevant patent is in force. Appropriate Capital Markets: For many governments seeking to expand technological capacity, attracting direct investment is very important, but there is also a question of making the most of the spill over benefits of investment. This can reveal a need for adequate capital markets. Governments can also promote inward investment through tax breaks and other forms of incentives designed to encourage technology transfer, in compliance with international trade rules. Alignment with Economic Development Priorities: The finite or limited resources available to governments imply that measures taken to promote technology transfer need to both be realistic and to fit with overall policy goals. A technology transfer policy dedicated to the creation of completely new types of economic activity and one which is as complex and as highly regulated as the pharmaceutical sector can present a much bigger challenge than building on a sector that already exist. Co-operative research agreements: Global support for public sector research might be encouraged is through co-operative research agreements designed to meet specific goals. It would seem more feasible to focus efforts on technologies of significant social benefit to the developing nations. Possible treaty on scientific access: There has also been a proposal for an international treaty on access to knowledge and technology negotiated on the basis of the type of reciprocity found in normal international trade negotiations. The concept is mean to be non- zero sums in the sense that, like free trade in goods, free trade in scientific ideas benefits all and such arrangements could be made bilaterally as well as multilaterally. SUCCESS OF TECHNOLOGY TRANSFER: The different “C” for successful technology transfer is: Communication, Certainty, Challenges, Capacity and Commitment 36. Communication: The technology transfer chain is often long, in terms of both distance and time. Effective communication is thus another essential ingredient in the recipe for successful technology transfer. Efficient and effective two way communication and corporation between key stakeholders will do much to remove barriers. Certainty: A lack of certainty, and the consequential high levels of risk, both real and perceived, are recognized a major impediments to the successful establishment and ongoing operation of functional markets. Removing barriers to technology transfer often translates into increased certainty, and decreased risk, for the key stakeholders such as developers, suppliers and recipients. Challenges: There are many barriers to successful technology transfer. All along the transfer path, from the supply side of technology to demand side, impediments occur at very node and, due to restrictions on movement of information and materials, for every linkage in technology transfer chain. Capacity: Enhancing the transfer of technologies that support sustainable development in largely about creating favourable circumstances for technology transfer-ensuring all stakeholders have the ability to fulfil their roles and meet their responsibilities, expeditiously. All key players and stakeholders must have the necessary knowledge and skills to perform the roles and tasks expected of them. Commitment: For a successful technology transfer there may be a good commitment to overcoming the challenges, providing technology users with the choice they deserve and desire, increase certainty, reducing risks, enhancing the communication between technology transfer stakeholders and building and strengthening the enabling environment and thus the capacity for technology transfer. CONCLUSION: Appropriate efficiency in technology transfer from development to commercialization can be achieved through better communication and documentation by technology transfer team. A cooperative effort by team results in more successful initial and consistency runs leading to an earlier license, earlier launch and a greater market share. Use of improved approaches like technology transfer to the development and start-up of new production systems will enable pharmaceutical organizations to fully benefit from the recent improvements in the new drug discovery and to complete more effectively in a rapidly changing marketplace. A dedicated technology transfer organization is set up to facilitate and execute the process. Technology transfer can be considered successful if a receiving unit can routinely reproduce the transferred product, process or method against a predefined set of specifications is agreed with a sending unit and/or a development unit. Licensing is an important phenomenon of technology transfer that has gained momentum in pharmaceutical industry by which pharmaceutical companies can contribute to research and development. Technology transfer is a complex issue and should be deal with using holistic approach. Mahboudi M, Ananthan BR. Effective factors in technology transfer in the Pharmaceutical industries of Iran: A Case Study. The IUP Journal of Knowledge Management 2010; 8: (1 & 2): 99. Bendis R, Byler E. Creating a National Innovation Framework, Building a Public-Private Support System to Encourage Innovation. Science progress 2009. Reamer A, Icerman L, Youtie J. Technology Transfer and Commercialization: Their Role in Economic Development 2003; 10-16. Feifei YUE, Yigming YUE. Research on Technology Transfer in the Pharmaceutical Industry, Technology Transfer Journal of Tongji University. Natural Science 2008; 11-14. Steenhuis HJ, De Boer SJ. Differentiating between types of technology transfer: the technology building. International Journal of Technology Transfer and Commercialization 2002; 1(1/2): 187-200. Ghafaripour A. Fundamental Concepts for Technology Transfer Process, Industries Ministry, Tehran 1999. Gupta et al. Technology Transfer in pharmaceutical industry: An overview. 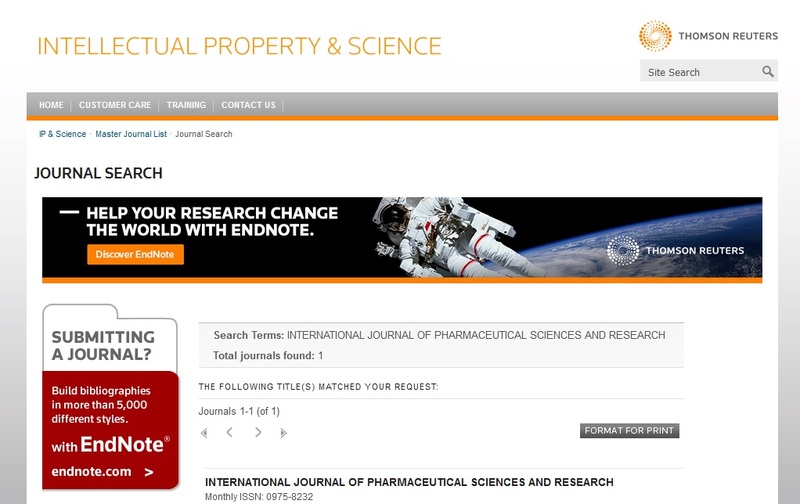 Novel Science International Journal of Pharmaceutical Science 2012; 1(7): 430-434. Steenhuis HJ. International Technology Transfer: Building Theory from a multiple Case-Study in The Aircraft Industry, Doctoral Thesis, University of Twente, the Netherlands, 2000. Gorman ME. Types of knowledge and their roles in technology transfer. Journal of Technology Transfer 2002;27: 219-231. Gibson M. Pharmaceutical Preformulation and Formulation: A Practical Guide form Candidate Drug Selection to Commercial Dosage Form, Interpharm/CRC Press, A division of Taylor and Francis Books 2001, Inc, FL, USA. Liebowitz S. PhD. Pharmaceutical Technology Transfer: Pre and Post NDA Submission. Pharm Tech Conference 1995. Patel DS, Nadiad. Technology Transfer an Overview of Pharmaceutical Industry. Int Biopharm Association Publ 2009; 2(4): 2-8. Patil RP. Technology Transfer in Pharmaceutical industry: Objective, Issues and Policy Approaches. Int J Pharma Res Dev 2010; 2(10): 43-48. Singh A, Aggarwal G. Technology Transfer in Pharmaceutical Industry: A Discussion. Int J Pharma Biosci 2009; 1(3): 1-5. Al Ali S. Developing countries and technology transfer. International Journal ofTechnology Management 1995; 10 (7/8): 704-713. Al Ghailani HH, Moor WC. Technology Transfer to developing countries. International Journal of Technology Management 1995; 10 (7/8): 687-703. Ali S, Pandit V, Chander S. Technology Transfer in Pharmaceuticals. Int Res J Pharm 2012; 3(6): 43-48. Reddy NM, Zhao L. International technology transfer: A review. Research Policy 1990; 19(4): 285-307. ISPE Good practice guide, Technology transfer, Tampa, FL, International Society for Pharmaceutical Engineering 2003. Jandia MS, Sreedhar D, Ligade VS, Pise A, Udupa N. Facts of Technology Transfer: A perspective of Pharmaceutical Industry. Ind J of property rights 2008; 13: 28-34. Ramanathan K. The role of technology transfer services in technology capacity building and enhancing the competitiveness of SMEs, Mongolia National Workshop on “Subnational Innovation systems and Technology Capacity-building Policies to Enhance Competitiveness of SMEs.” Organized by UN- ESCAP and ITMRC (Mongolia), Ulaanbaatar, Mongolia 2007; 27-33. Robinson RD. The international transfer of technology, Theory, issues, and practice, Cambridge, MA: Ballinger Publishing Company 1988. Souder WE, Nashar AS, Padmanathan V. A guide to the best technology transfer practices. Journal of Technology Transfer 1990; 15: 1-2. Teece DJ. The market for know-how and the efficient international transfer of technology. Annals American Academy of Political and Social Science 1981; 45(8): 81-96. Sexton F. Effective and efficiency knowledge transfer from R&D to manufacturing, Purdue Pharma’s SMC meeting 2004. Autio E, Laamanen T. Measurement and evaluation of technology transfer: Review of technology transfer mechanisms and indicators. International Journal of Technology Management 1995; 10(7/8): 643-664. Technology Atlas Team, Components of technology for resources transformation. Technological Forecasting and Social Change 1987; 32: 19-35. Donald et al. Transfer of Process from Development to Manufacturing. Drug Information Journal 1998; 32: 19-26. Ortega AJ, Arce NA, Sequeda F, Gribenchenko I. Management of Innovation and Technology Transfer Process Between University and Industry. The Mater Res Cent Case in Universidad del valle, Colombia 2009; 2: 7-8. Godkin L. Problems and practicalities of technology transfer: a survey of the literature. International Journal of Technology Management 1988; 3(5): 587-603. Madu CN. Transferring technology to developing countries – Critical factors for success. Long Range Planning 1989; 22(4): 115-124. Mansfield E. East-West technological transfer issues and problems, International technology transfer: forms, resource requirements, and policies. American Economic Review 1975; 65(2): 372-376. Dogra R, Garg R and Jatav P: Technology Transfer in Pharmaceutical Industry: Transfer of process from Development to Commercialization. Int J Pharm Sci Res 2013; 4(5); 1692-1708.